An overview of the new Science Center in the Corpus Christi Museum of Science and History at 1900 N. Chaparral St. The center is now completely finished and open to the public full-time. EDITOR’S NOTE: The best way to find out if kids are going to like something is to ask them. With that in mind, Corpus Christi Business News asked young reporter Kai Meyer to visit the new Science Center at the Corpus Christi Museum of Science and History during one of its previews in March. 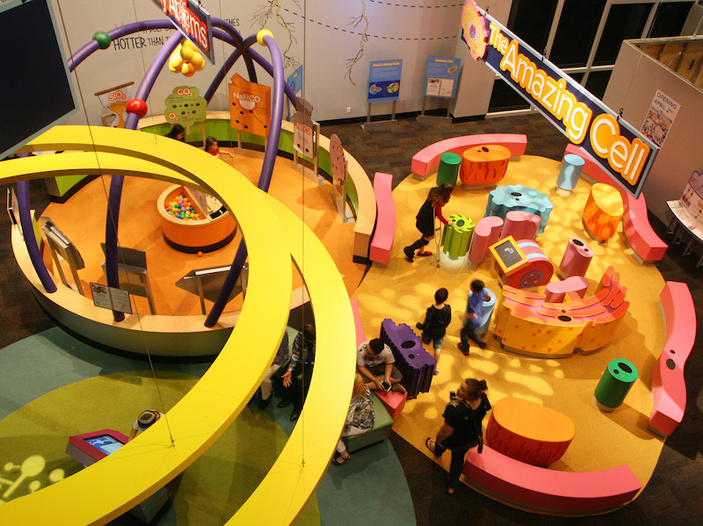 Here’s his report on how to get the best out of your visit to this exciting new exhibit. My name is Kai. I’m 10 years old, and I'd like to give you my thoughts on the Corpus Christi Science and History Museum's new exhibit for children. I found the new exhibit very entertaining and interesting, and I’m really excited because they’re going to keep adding more to it. Kai Meyer shows his dad, Pete Meyer, how to get the most out of his visit to the new Science Center at the Corpus Christi Museum of Science and History. When you go, I think you should start off in the Chemistry Reaction area, where you can combine almost any molecule in the Periodic Table of Elements to make almost any substance. For instance, if you add two Boron atoms and one Titanium atom you get a Titanium boride molecule. When you click “React” on the touch-screen display that you’re standing at, the screen on the wall in front of you shows what you’ve just created. Next to that, you can use orbs and sticks to make a model of a molecule. It reminds me of playing with scientific Tinker Toys. Gabriela Deleon, 5, proudly shows a model of a molecule she built at the Science and History Museum's new Science Center. Float over to the Outer Space section and learn about gravity and magnetism and play a vertical version of pinball. When you pull the knob down, you lean that the more force you apply, the more the ball is able to fight gravity on its way up. The rock climbing wall called Reach for the Stars was too easy for me but a lot of kids liked it. You put your hands and feet on the colorful “asteroid” pieces on the wall and pull yourself up so you can touch the yellow stars near the top. When you touch the star, it makes a “ding-ding-ding” or cheering or buzzing sound. Carmelo Moore, 4, and Lila Guzman, 5, climb the Reach for the Stars rock climbing wall in the new children’s Science Center at the Science and History Museum. Next to the climbing wall is the Gravity Well, a black hole coin receiver where you can watch your nickels and dimes spin down into the inky blackness where you shall never see them again (unless you have the key to the coin drawer at the bottom). Right around the corner is the Planetarium where you can watch a documentary on the domed ceiling about what NASA is planning to do to get to Mars. I learned that NASA is trying to make heat-resistant material for the rockets, because to get enough energy to get back to Earth, you’re going to get sling-shotted around Mars. That means you’ll need more protection so you don’t get burned up and scattered across the skies. There’s a lot of friction when you reenter the atmosphere. The next room is about dinosaurs. Painted murals of different time periods are on the walls, like one with a giant dragonfly. Another has dinosaurs. The front wall is like a big movie screen and you can run beside it with creatures that time has long forgotten. That’s more fun for younger kids. A guy who works there told me that they’re going to expand this room so you’ll be able to interact with different dinosaurs. Leaving the dinosaurs behind, open your mind to math. The Tessellations display shows geometric tiles that play tricks on your eyes. You can’t tell if it’s background or foreground. You might think the ducks are in the foreground and the fish are in the background, but then if you change your perspective you see it opposite. At the Fractions display, you can arrange tiles to represent different fractions, so it makes learning math more hands on. Brendon Eller, 8, plays a PVC pipe xylophone in the new playground at the Science and History Museum. Next comes the human body section where you can build a DNA chromosome by fitting the colored pieces together to create a strand. Next to that, you can literally walk through the inside of a giant human cell and learn all about different types of tissue like the nucleus and cell membrane. The Corpus Christi Museum of Science and History is located at 1900 N. Chaparral Street. Call (361) 826-4667 for more information. You can also visit the website at ccmuseum.com.